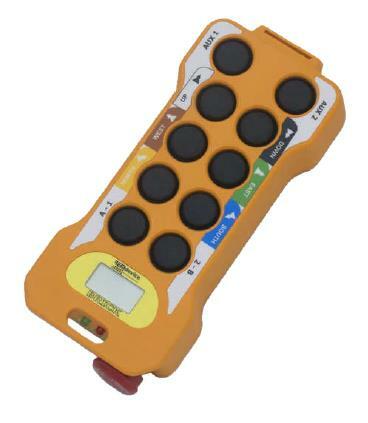 The Brick radio remote control hand held transmitter with shoulder strap is designed for cranes and bridge cranes. The Brick features a compact, ergonomic and lightweight design with rugged elastomer buttons, and a heavy duty Nylon housing that protects against shock, impact, and is resistant to acids, oils and other chemicals. Installation is simple with integral LEDs for channel indicators for changing frequency. The Brick has an automatic off function to preserve battery life, and an option to allow low power start up, as well as a programmable button to further customize the controls.